This is an example of a badly worn tyre as you can see the right of the tyre is worn very badly and is dangerous as the wire re-inforcement is showing through. If you look down the centre of the tyres you can see the thread depth markers in the three grooves. If your tyres are worn to these markers they need replacing. 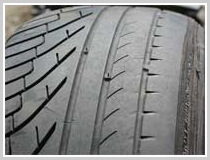 This is an example of a new tyre and as you can see the difference is clear. 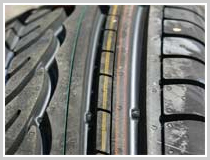 If you are uncertain about your tyres call into your local tyre centre and they will be pleased to carry out a tyre check for you.